Fairfield – Kathleen “Cricket” Aylward, a native Vermonter, passed away unexpectedly, Wednesday March 20, 2019, at the UVM Medical Center with her family by her side. Born in Proctor, Vermont on September 26, 1951, she was the only daughter of the late John “Red” and Pauline (McCarthy) Rolfe. Cricket was 67 years old. On June 7, 1975 in St. Albans, she married the love of her life, Stanley Earl Aylward, who survives her. Cricket was a 1970 graduate of Bellows Free Academy, then worked for Union Carbide, IBM, and retired from Smugglers Notch. She and Earl loved to play golf, enjoyed sailing, skiing and bowling, trips to the Akwesasne Mohawk Casino and any opportunity to be with the people they loved most. She particularly enjoyed this time of year, as she and her family have a small sugaring operation. Her family was most important to her, she never missed a sporting event or the opportunity to look after her grandchildren. Cricket’s last gift was being an organ donor. Survivors include her husband of 43 years, Earl, of Fairfield; their children, Craig Aylward and his wife, Alisa, of Fairfield and Trudy Cioffi and her husband, John, of St. Albans, as well her grandchildren, Jake, Tanner, Cooper, Andrea, Noah, Hailey and Amelia. She is survived by her brothers, Tim, Don and Kim Rolfe. Also, many nieces, nephews, cousins and numerous friends who have become like family and were important to her. In addition to her parents, Cricket was pre-deceased by her in-laws, Stanley and Georgette Aylward and her brother, John. Relatives and friends are invited to attend calling hours on Sunday, March 24, 2019, from 4:00 to 7:00 PM at the Heald Funeral Home, 87 South Main Street, St. Albans. A funeral service will be held on Monday, March 25th, at 11:00 AM at the Heald Funeral Home, with the Reverend Maurice J. Roy officiating. In lieu of flowers, memorials may be made to a Charity of One’s Choice. To send Cricket’s family a message of condolence or share a memory, kindly go to her online guestbook at www.healdfuneralhome.com. 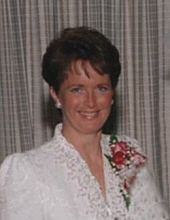 To plant a tree in memory of Kathleen "Cricket" Aylward, please visit our Tribute Store. "Email Address" would like to share the life celebration of Kathleen "Cricket" Aylward. Click on the "link" to go to share a favorite memory or leave a condolence message for the family.